With Beverly Art Walk Week, our producing partner the Beverly Area Arts Alliance celebrates art in all its forms: visual, spoken, musical, poetic and more. Art moves, it challenges and it celebrates. In this spirit, we’re thrilled to have Patricia Frazier joining us this Tuesday for The Frunchroom, our celebration of South Side storytelling. A filmmaker, activist and Chicago and national Youth Poet Laureate, Patricia uses art to express issues of urgency and celebrate young and black political movements. 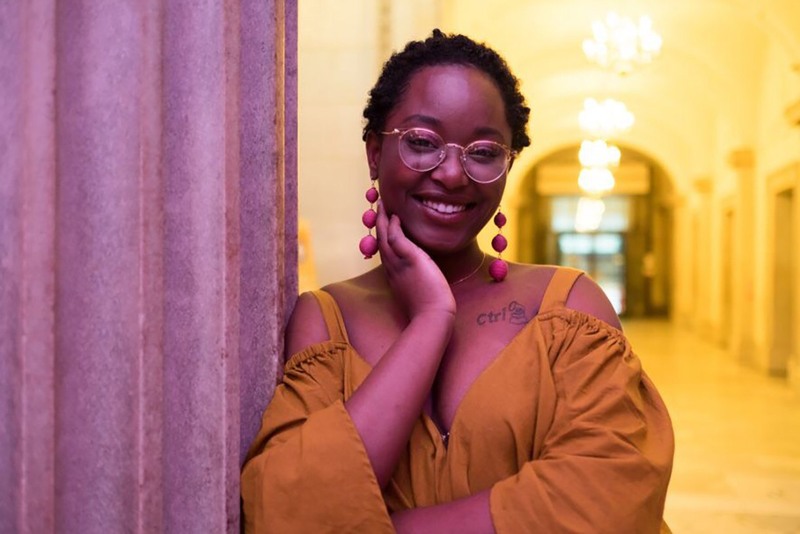 Young Chicago Author’s newest teaching artist, she has appeared in Chicago Magazine, South Side Weekly, New City‘s Lit 50, Vogue, and has performed with Apple Inc. at the Library of Congress, Federal Hall and more. She is an organizer with Assata’s Daughters, a intergenerational, grassroots organization of women-and-femme-identifying folks working to deepen, sustain and escalate the Black Lives Matter movement. The Davis-Putter scholar currently studies Cinema Arts and Sciences at Columbia College Chicago. Join Patricia and our other readers this Tuesday at Beverly Arts Center. Tuesday, September 25th, 730pm, Beverly Arts Center. $5 donation requested to benefit the Beverly Area Arts Alliance. This entry was posted in Lineups and tagged Patricia Frazier, september 25. Bookmark the permalink.